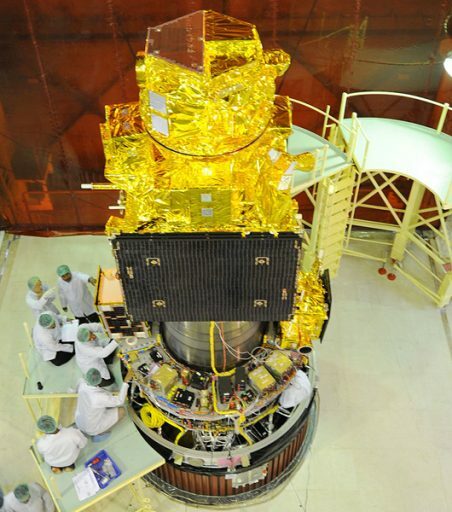 ResourceSat-2A is a multi-instrument Earth Observation Satellite of the Indian Space Research Organization designed as a follow-on and data continuity mission to ResourceSat-2 launched in 2011 to continue a record of the first ResourceSat mission from 2003. Outfitted with three electro-optical imaging systems, ResourceSat aims to deliver multispectral image products for a variety of applications in agriculture, forest mapping, water resource management, rural infrastructure, and disaster management. 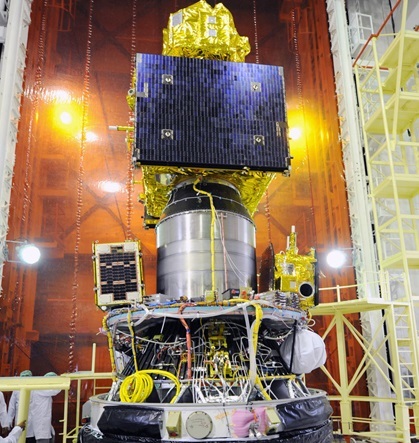 ResourceSat-2 was launched atop a PSLV rocket in April 2011 with a five-year life expectancy and ISRO expected to send a nearly identical replacement into orbit to deliver continuous data in the expanded RS-2 spectral bands. The RS-2A satellite carries a pair of Linear Imaging Self-Scanning Sensors and an Advanced Wide Field Sensor to capture a combination of high-resolution and wide-swath data. 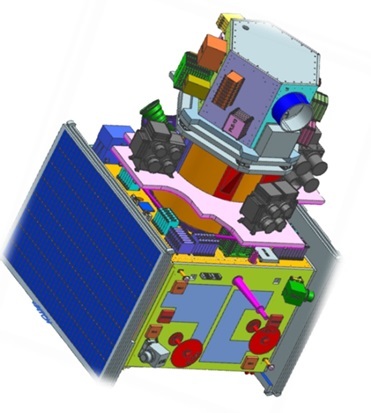 The ResourceSat-2A spacecraft comprises two modules – a box-shaped spacecraft platform and a payload module sitting on top. This modular design permits the platform and payloads to be integrated separately before being joined late in the satellite assembly phase. The spacecraft stands 2.1 meters tall and is 2 meters in diameter with a launch mass of 1,235 Kilograms. 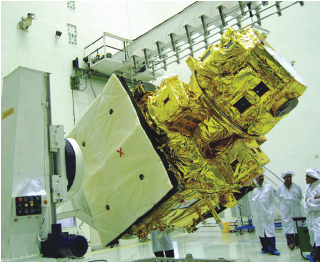 ResourceSat-2A employs an iteration of the IRS-1 satellite platform that debuted in 1988 with the IRS-1A satellite – India’s first indigenous remote sensing satellite. 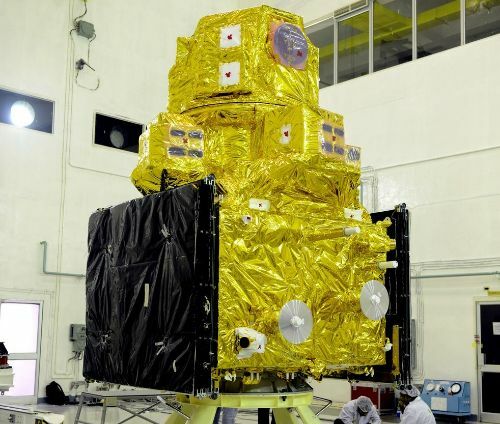 The Indian Remote Sensing Satellite Bus has been improved over the years to keep up with the current state of technology and has hosted different instrument payloads including imaging payloads, ocean radiometers and cartography payloads. The main spacecraft platform is built around a central tube, 91.5 centimeters in diameter and acting as the primary load bearing structure of the satellite – at its base is the launch vehicle adapter and the tube supports all structural components of the satellite. Four vertical aluminum-honeycomb panels and two horizontal decks are attached to the central cylinder, providing mounting surfaces for the various components. Sitting on top of the box-shaped platform is the payload module which, like the main bus, consists of a cylinder made of carbon-fiber reinforced polymer material and acts as the load-bearing structure of the payload assembly. It is attached to the platform’s cylinder via a strut assembly for efficient load transfer. ResourceSat-2A hosts a pair of power-generating solar arrays, each with three 1.4 by 1.8-meter panels to generate 1,250 Watts of End-of-Life power. Active sun-tracking points the arrays for optimized power generation and power is stored in a pair of 24 Amp-hour battery units with dedicated electronics controlling the state of charge of the battery and distributing two unregulated power buses to the satellite subsystems with an operational voltage of 28 to 42 V.
The IRS platform is baselined for a monopropellant propulsion system comprising four 11-Newton and eight 1N Hydrazine thrusters to be used for orbital adjustments and to assist in attitude control when required. The primary attitude actuators of the spacecraft are four 4Nms reaction wheels and a pair of magnetic torquers that are used when unloading the reaction wheels as part of regular momentum dumps. Reaction Wheels function by accelerating a rotating inertial mass to introduce a torque acting on the spacecraft in the opposite direction. Control along all three axes is possible with three wheels, a fourth acts as a redundant component. To avoid spinning the wheels at excessive rates, they are regularly spun down which also creates a torque that has to be countered by the magnetic torquers that create angular momentum by running a current through coils in the presence of Earth’s magnetic field. Attitude determination is accomplished during nominal mission mode by a pair of star trackers that acquire optical imagery of the star-filled sky which are then compared to an onboard star catalog to precisely calculate the spacecraft’s three-dimensional position in space. Digital and analog sun sensors are used to point the solar arrays toward the sun and in spacecraft safe mode. A set of gyroscopes is responsible for precisely measuring body rates on the spacecraft during maneuvers and tracking accelerations during engine burns. Earth aspect sensors are available as a backup attitude determination device achieving an accuracy of 0.1° compared to an attitude knowledge of 0.006° when using the star trackers. The pointing error when using star trackers is under 0.05°. ResourceSat-2A employs an S-Band communications terminal for command uplink and spacecraft housekeeping data downlink at data rates of 100 bit/s for uplink and 1-16kbit/s for downlink. The S-Band system is also responsible for two-way Doppler Ranging, accepting and demodulating ranging tones for downlink after a known turnaround ratio to enable precise orbit determination from the ground. Data generated by the Earth Observation Payload is stored in a 400Gbit Solid State Recorder that can hold approximately one hour of data from the mission’s prime instrument. Payload data is downlinked to Earth in X-Band at a data rate of 105 Mbit/s fed from a Baseband Data Handling System that is in charge of collecting, processing, storing and conditioning payload data. 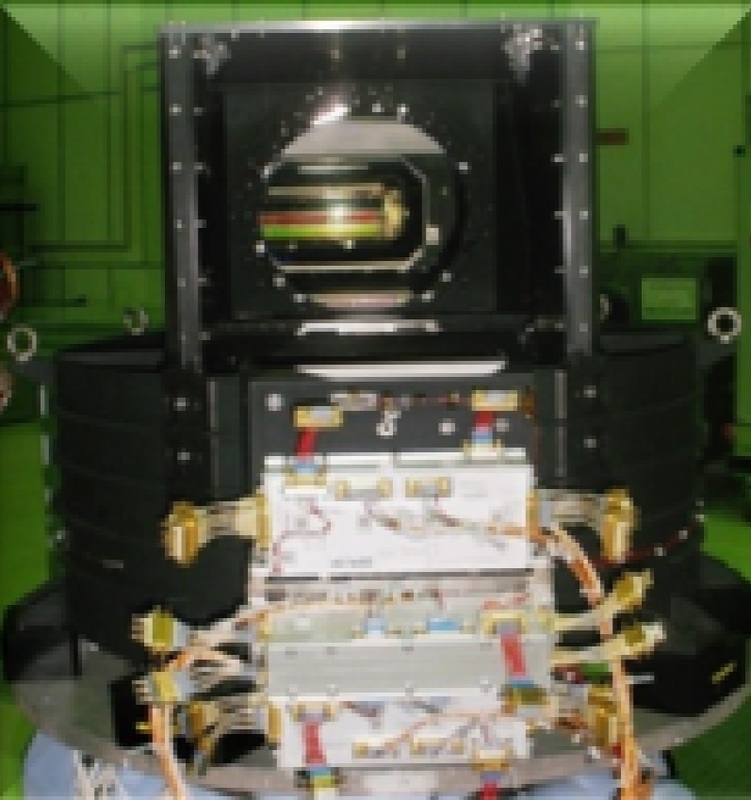 The internal data system operates two separate chains, one for the primary LISS-4 instrument and the other for the LISS-3 and AWiFS instruments. Downlink of the two chains is accomplished by two different carrier frequencies at 8125 MHz for LISS-4 and 8300MHz for the other two instruments. 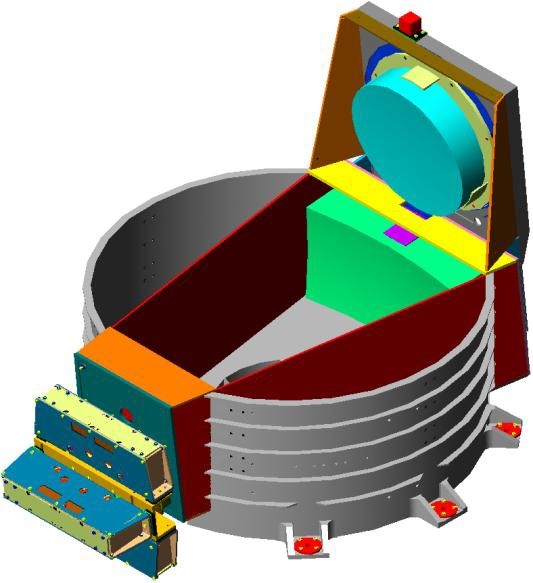 The ResourceSat-2 payload suite comprises three instruments with a combined mass of 380 Kilograms, residing on the payload module of the spacecraft. The payload includes the Linear Imaging Self-Scanning Sensors 3 & 4 (LISS-3 & 4) and an Advanced Wide Field Sensor (AWiFS). All imaging instruments installed on the satellite are pushbroom scanners employing linear detector arrays that image continuous lines of images to assemble image strips as the satellite moves forward. AWiFS acts as the wide-strip imager of the satellite, using a pair of cameras to deliver a combined swath width of 740 Kilometers with a ground resolution of 56 meters. The LISS-3 instrument covers an intermediate swath of 141 Kilometers with an image resolution of 23.5 meters and LISS-4 acts as the high-resolution imager delivering a 70km swath and a spatial resolution better than 5.8 meters. LISS-4 is a multispectral high resolution imaging instrument based on the LISS-3, weighing in at 169.5 Kilograms. It is a three-band pushbroom scanner with a spatial resolution of 5.8 meters suitable for a number of applications including environmental monitoring and urban planning. LISS-4 employs a three-mirror reflective optical telescope feeding three CCD line detectors, each covered by an individual bandpass filter that selects the three wavelength bands. 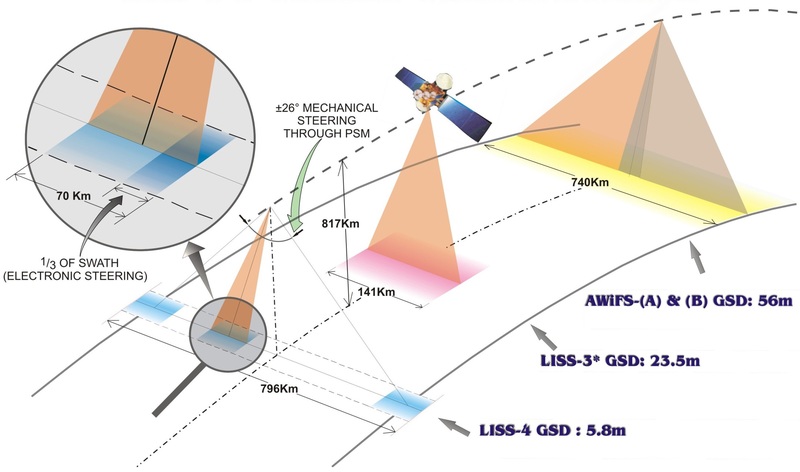 A prism is installed in the optical path of the instrument to split the incoming beam into three imaging fields that are separated in the along-track direction resulting in a separation of 7.1 Kilometers between each of the channels. The instrument covers three spectral bands at 520 to 590 nanometers (green), 620-680nm (red) and 770-860 (near-infrared) – each channel with its own 12,288-pixel Charged Coupled Device line detector, featuring 7 x 7-micrometer pixels. In Multispectral Mode, only a third of each detector (4096) pixels can be operated, limiting the swath width of the instrument to 23.9 Kilometers but collecting simultaneous data in all three bands. The 4096 active pixels can be freely selected on each line array. In Mono Mode, all 12k pixels on a single detector are in active use, broadening the swath width to 70 Kilometers, but only permitting one wavelength band to be covered. 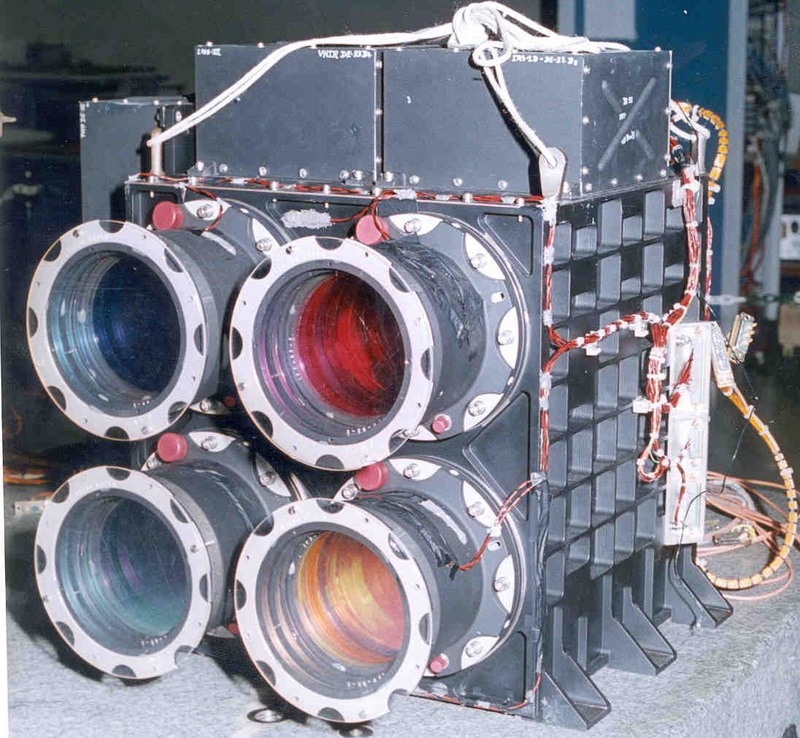 The LISS-4 camera is installed on a rotating deck attached to a Payload Steering Motor which physically rotates the instrument by +/-26 degrees off-nadir. This creates a field of regard of 796 Kilometers and reduces the revisit time for the instrument to five days, plus adding a capability of monitoring events of interest within the wider FOR. Thermal control on the instrument is provided by a radiator plate connected to each CCD line through heat pipes and braid strips. An internal calibration source is provided in the form of eight LEDs positioned in front of the detectors and stepped through 16 exposure levels to deliver calibration data covering the entire dynamic range of the detectors. LISS-4 requires 216 Watts of electrical power and delivers a data rate of 105 Mbit/s regardless of the imaging mode since both modes employ the same number of actively read-out pixels. The LISS-3 instrument fills the medium-resolution slot on the ResourceSat-2 satellite, also using a pushbroom scanner, but covering four wavelength bands. LISS-3 hosts four separate lens modules and detector assemblies, each with its own specific bandpass filter to select the instrument’s spectral bands: 0.52-0.59 µm (green), 0.62-0.68 µm (red), 0.77-0.86 µm (near infrared) and 1.55-1.77 µm (short-wave infrared). All channels employ 6,000-pixel line detectors with the two visible channels featuring standard Charged Coupled Devices, the near infrared channel uses a Indium Gallium Arsenide CCD array and the SWIR channel uses a CMOS detector, an improved version of the SWIR detector flown on ResourceSat-2. The LISS-3 imaging architecture creates an image swath of 141 Kilometers with all channels achieving a resolution of 23.5 meters. Like the LISS-4 instrument, LISS-3 uses four LEDs per optical module in the VNIR bands and six LEDs in the SWIR band, operated in pulse mode varied at different pulse lengths to distribute light onto the detectors. The instrument delivers 100% albedo coverage with 1024 levels of quantization (10 bits). LISS-3 and its instrument electronics unit have a mass of 106 Kilograms, require 70 Watts of electrical power and generate 52.5Mbit/s of data when in operation. The B2 Band (green) covers the peak of the vegetation reflectance curve and is therefore useful for the discrimination of vegetation while Band 3 (red) covers the chlorophyll absorption region and can be used to assess overall plant health using the Normalized Difference Vegetation Index (NDVI) which is commonly used to assess crop vigor and biomass. The NIR band covers the high-reflectance plateau of vegetation reflectance which is dependent on the internal structure of the leaves, thus making this band useful for the estimation of green biomass and crop health. The SWIR Band is sensitive for monitoring plant water content, discriminating between crop and forest types and conducting damage assessments. Also, the band can be used to monitor snow clouds and for rock-type determination. 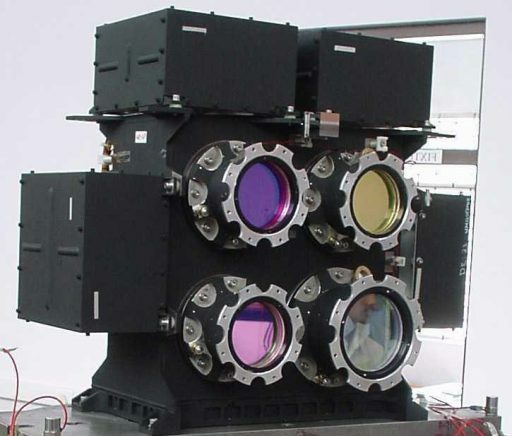 AWiFS the Advanced Wide Field Sensor is a medium-resolution camera comprised of a pair of opto-electronic assemblies tiled by 11.94 degrees relative to spacecraft nadir to establish a +/-25-degree field of view translating to a wide ground swath of 740 Kilometers. Each of the modules covers a 370km swath with a side lap between them. With its wide swath, AWiFS achieves a revisit time of five days, generating imagery at a ground resolution of 56 meters at nadir and 70 meters at the edge of the swath. Each of the four electro-optical assemblies houses a refractive imaging system with a band pass interference filter and a neutral density filter placed in front of a 6000-pixel CCD line detector for each imaging band. The spectral bands covered by AWiFS are identical to those of the LISS-3 instrument (see above). In-flight calibration sources are also part of AWiFS in the from of six LEDs that are operated at 16 intensity levels for the VNIR channels and a pulsed calibration cycle for the SWIR channel, similar to the LISS-3 instrument. AWiFS has a mass of 104 Kilograms and draws 114 Watts of power, generating data at a rate of 52.5Mbit/s. Not considered part of the instrument payload, but also facilitated within the payload module is the Payload Data Handling System that receives digital data from each of the cameras which is then modified with auxiliary data such as time and spacecraft position and stored in a pair of 200Gbit Solid State Recorders. For LISS-4, a Differentially Pulse Code Modulation is employed to encode the 10-bit image data into seven bits. When downlinking, the BDH main unit retrieves data from the recorders and sends it to the two 105Mbit/s downlink chains. 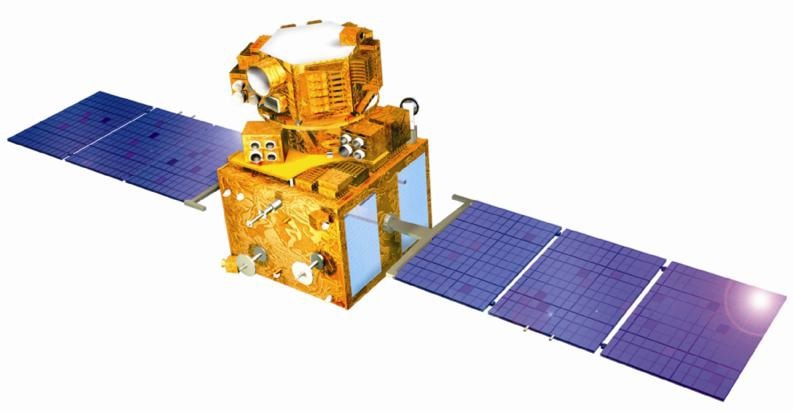 ResourceSat-2A, like its predecessors, operates from a Sun Synchronous Orbit 817 Kilometers in altitude, inclined 98.78 degrees with a period of 101.35 minutes and a local time of descending node of 10:30. Initially, the satellite will be phased 180° to the ResourceSat-2 spacecraft to enhance the revisit cycle of the temporary constellation that will exist as long as both spacecraft are operational. The ground track of the satellite is maintained within +/-1 Kilometer with a repeat cycle of 24 days. 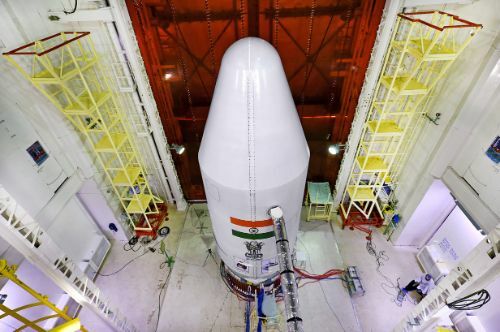 Copyright © 2019 PSLV C36 | Spaceflight101. All rights reserved.